36 square metres with twin beds. Complete bathroom, mini-bar, satellite TV, air conditioning & hair dryer. A magnificent and comfortable hotel, built in the traditional style, but fully equipped with all modern conveniences and facilities, and with the most artistic and current technology. The hotel offers, besides its many and varied activities, the unique opportunity to gain deep knowledge of this still unknown area of South-East Morocco. Get in personal contact with the culture, the traditions, the people, the gastronomy and many other things that you will discover and that will surprise you in many ways. 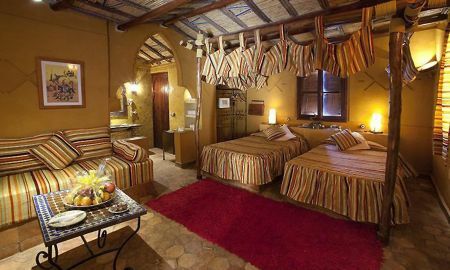 The Kasbah is located 5 kms away from the city of Erfoud, on the Road from Erfoud to Errachidia. 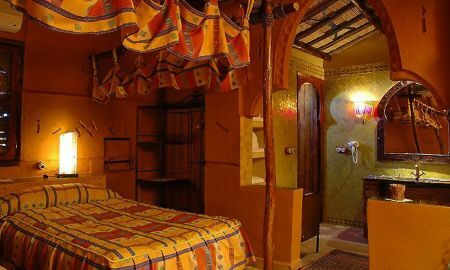 The Kasbah is in the heart of the Tafilalet Region and strategically placed between the vast palm grove of the Ziz valley and the majestic dunes of Erg Chebbi.